The Martian is a 2011 science fiction novel written by Andy Weir. It was his debut novel under his own name. [a] It was originally self-published in 2011; Crown Publishing purchased the rights and re-released it in 2014. The story follows an American astronaut, Mark Watney, as he becomes stranded alone on Mars in the year 2035 and must improvise in order to survive. The Martian, a film adaptation directed by Ridley Scott and starring Matt Damon, was released in October 2015. In 2035, the crew of NASA's Ares 3 mission have arrived at Acidalia Planitia for a planned month-long stay on Mars. After only six sols, an intense dust and wind storm threatens to topple their Mars Ascent Vehicle (MAV), trapping them on the planet. During the hurried evacuation, an antenna tears loose and impales astronaut Mark Watney, a botanist and engineer, also disabling his spacesuit radio. He is flung out of sight by the wind and presumed dead. As the MAV teeters dangerously, mission commander Melissa Lewis has no choice but to take off without searching for Watney. However, Watney is not dead. His injury proves relatively minor, but with no long-range radio, he cannot communicate with anyone. He must rely on his own resourcefulness to survive. He begins a log of his experiences. His philosophy is to "work the problem", solving each challenge in turn as it confronts him. With food a critical, though not immediate, problem, he begins growing potatoes in the crew's Martian habitat (the Hab), and burns hydrazine to generate water for the plants. NASA eventually discovers that Watney is alive when satellite images of the landing site show evidence of his activities; they begin devising ways to rescue him, but withhold the news of his survival from the rest of the Ares 3 crew, on their way back to Earth aboard the Hermes spacecraft, so as not to distract them. Watney plans to drive 3,200 km (2,000 mi) to Schiaparelli crater where the next mission, Ares 4, will land in four years and their MAV is already pre-positioned. He begins modifying one of the rovers for the journey, adding solar cells and an additional battery. He makes a three-week test drive to recover the unmanned Pathfinder lander and Sojourner rover and brings them back to the Hab, enabling him to contact NASA. Mitch Henderson, the Ares 3 flight director, convinces NASA Administrator Teddy Sanders to allow him to inform the Ares 3 crew of Watney's survival; they are thrilled, except for Lewis, who is guilt-stricken at leaving him behind. The canvas at one of the Hab airlocks tears due to Watney's repeated use of the same airlock, which was never designed for such intensive usage. This results in the decompression of the Hab and nearly kills him. He repairs the Hab, but his plants are dead, threatening him again with eventual starvation. Setting aside safety protocols due to time constraints, NASA hastily prepares an unmanned probe to send Watney supplies, but the rocket disintegrates after liftoff. A deal with the China National Space Administration provides a ready booster—planned for use with the Taiyang Shen, an unmanned probe—to try again. With no time to build a probe with a soft-landing system, NASA is faced with the prospect of building a capsule whose cargo can survive crashing into the Martian surface at 300 meters per second (670 mph). However, astrodynamicist Rich Purnell devises a "slingshot" trajectory around Earth for a gravity assist that could get Hermes back to Mars on a much-extended mission to save Watney, using the Chinese rocket booster to send a simpler resupply probe to Hermes as it passes Earth. Sanders vetoes the "Rich Purnell Maneuver", as it would entail risking the other crewmembers, but Henderson secretly emails the details to Hermes. All five of Watney's crewmates approve the plan. Once they begin the maneuver (having disabled the remote overrides), NASA has no choice but to support them. The resupply ship docks with Hermes successfully. Watney resumes modifying the rover because the new rescue plan requires him to lift off from Mars in the Ares 4 MAV. While working on the rover, Watney accidentally shorts out the electronics of Pathfinder, losing the ability to communicate with Earth (except for spelling out Morse code with rocks). After Watney leaves for Schiaparelli, NASA discovers that a dust storm is approaching his path, but has no way to warn him. The rover's solar cells will be less and less able to recharge, endangering both the rendezvous and his immediate survival (if there is not enough power to run his life-support equipment). While crossing Arabia Terra, Watney becomes aware of the darkening sky and improvises a rough measurement of the storm's shape and direction of movement, enabling him to go around it. Surviving a rover rollover on his descent into Schiaparelli, Watney reaches the MAV and reestablishes contact with NASA. He receives instructions on the radical modifications necessary to reduce the MAV's weight to enable it to intercept Hermes during its flyby. The modifications include removing the front of the MAV, which Watney has to cover with Hab canvas. After takeoff, the canvas tears, creating extra drag and leaving the MAV too low for the rendezvous. Lewis hastily improvises a plan to intercept the MAV by firing Hermes' attitude thrusters and then blowing a hole in the front airlock with an improvised sugar-and-liquid-oxygen bomb, using the thrust from the escaping air to reduce speed. Beck, the Hermes' EVA specialist, uses a Manned Maneuvering Unit, MMU, on a tether to reach Watney and bring him back to Hermes. In a final log entry, Watney expresses his joy at being rescued, reflecting on the human instinct to help those in need. Andy Weir, the son of a particle physicist and electrical engineer, has a background in computer science. He began writing the book in 2009, researching related material so that it would be as realistic as possible and based on existing technology. Weir studied orbital mechanics, astronomy, and the history of human spaceflight. He said he knows the exact date of each day in the book. He specifically avoided physically describing the characters when not necessary for the plot. Having been rebuffed by literary agents when trying to get prior books published, Weir decided to put the book online in serial format one chapter at a time for free at his website. At the request of fans, he made an Amazon Kindle version available at 99 cents (the minimum allowable price he could set). The Kindle edition rose to the top of Amazon's list of best-selling science-fiction titles, where it sold 35,000 copies in three months, more than had been previously downloaded free. This garnered the attention of publishers: Podium Publishing, an audiobook publisher, signed for the audiobook rights in January 2013. Weir sold the print rights to Crown in March 2013 for over US$100,000. The book debuted on the New York Times Best Seller list on March 2, 2014, in the hardcover fiction category at twelfth position and remained on this list for four weeks without going above eleventh position. The trade paperback edition of the novel debuted on The New York Times Best Seller list on November 16, 2014, in the paperback trade fiction category at eighth position. It gradually rose to the top position for the week of June 28, 2015, before dropping down to number two for nine weeks, during which it was displaced by E. L. James' Grey, before returning to the top position on September 6, 2015. The book remained continuously at the number one position for 12 weeks before it was displaced on November 22, 2015, by Nora Roberts' Stars of Fortune for two weeks. The trade paperback returned to the top position for the third and final time on December 6, 2015, for six weeks before it was finally replaced on January 24, 2016. The trade paperback's final appearance on the list occurred on April 24, 2016, 76 weeks after its debut in this category. Overall, the trade paperback edition was on the top of its New York Times best seller category for a total of 19 out of 76 weeks that the edition was listed. The Martian was published in print by Crown on February 11, 2014. An audiobook edition, narrated by R. C. Bray and released by Podium Publishing, preceded the print release in March 2013 on Audible.com, and was later followed with an MP3 CD in association with Brilliance Audio. The audiobook was nominated and won an Audie Award (2014) in the Science Fiction category. A Classroom Edition, published by Broadway Books in May 2016, contains educational materials and uses school-appropriate language. In 2015, Andy Weir wrote a prequel short story to The Martian, titled "Diary of an AssCan". A 2017 German publication of an interview with Andy Weir and survival tips for living on Mars was published, titled "Der Mars Survival Guide", tying in to the novel and movie. In a starred review, Publishers Weekly said that "Weir laces the technical details with enough keen wit to satisfy hard science fiction fan and general reader alike." Kirkus Reviews called The Martian "Sharp, funny and thrilling, with just the right amount of geekery". The Wall Street Journal called the book "the best pure sci-fi novel in years." Entertainment Weekly gave the novel a grade of "B", describing it as "an impressively geeky debut novel" but saying Weir "stumbles with his secondary characters". USA Today rated The Martian three out of four stars, calling it "terrific stuff, a crackling good read" but noting that "Mark's unflappability, perhaps the book's biggest asset, is also its greatest weakness. He's a wiseacre with a tendency to steer well clear of existential matters." Amazing Stories commented, "Andy Weir's The Martian will leave you as breathless as if you'd been dropped on the Martian surface without a suit". The Japanese translation of the novel won the Seiun Award for Best Translated Long Story in 2015. Solanum watneyi, a species of bush tomato from Australia, was named after the fictional botanist. It is a member of the same genus as the potato, Solanum. At the 2016 Hugo Awards, Andy Weir won the John W. Campbell Award for Best New Writer for The Martian. The screenplay adapted from the novel additionally won Best Dramatic Presentation, Long Form. In March 2013, Twentieth Century Fox optioned the film rights, and hired screenwriter Drew Goddard to adapt and direct the film. In May 2014, it was reported that Ridley Scott was in negotiations to direct an adaptation that would star Matt Damon as Mark Watney. On September 3, 2014, Jessica Chastain joined the film as Commander Lewis. The ensemble cast also includes Kristen Wiig, Jeff Daniels, Michael Peña, Kate Mara, Sean Bean, Sebastian Stan and Chiwetel Ejiofor. The film was released on October 2, 2015. On December 5, 2014, the Orion spacecraft took the cover page of The Martian script on the first test flight of the unmanned Exploration Flight Test 1 (EFT-1). The script was launched atop a Delta IV Heavy on the flight lasting 4 hours and 24 minutes, landing at its target in the Pacific Ocean. ^ Weir wrote a novel before this called Theft of Pride under the pen-name "Jack Sharp" which was released on the web for free. ^ Ayres, Jeff (February 11, 2014). "Andy Weir delivers with 'The Martian'". Yahoo!. Associated Press. Retrieved February 16, 2014. ^ a b Catucci, Nick (February 12, 2014). "The Martian (2014)". Entertainment Weekly. Retrieved March 28, 2014. ^ McClintock, Pamela (June 10, 2015). "Fox Moves Ridley Scott's 'The Martian' to October". The Hollywood Reporter. Retrieved June 10, 2015. ^ Weir, Andy (September 23, 2015). "I am Andy Weir, author of 'The Martian'. AMA!". Reddit.com. ^ Burke, Laura M. (October 5, 2015). "An Examination of 'The Martian' Trajectory" (PDF). NASA / Glenn Research Center. GRC-E-DAA-TN27094. ^ Flatow, Ira (February 14, 2014). "Andy Weir: 'The Martian'". Science Friday. Retrieved March 28, 2014. ^ a b "The Martian". Skepticality. Retrieved March 5, 2015. ^ Wickman, Kase (October 9, 2015). "One Person Who Doesn't Think 'The Martian' Was Whitewashed? The Author". MTV News. Retrieved October 10, 2015. ^ "Best Sellers: Hardcover Fiction". The New York Times. March 2, 2014. Retrieved April 27, 2018. ^ "Hardcover Fiction - March 23, 2014". The New York Times. March 23, 2014. ^ "Hardcover Fiction - March 9, 2014". The New York Times. March 9, 2014. ^ "Paperback Trade Fiction - November 16, 2014". The New York Times. November 16, 2014. ^ "Paperback Trade Fiction - June 28, 2015". The New York Times. June 28, 2015. ^ "Paperback Trade Fiction - September 6, 2015". The New York Times. September 6, 2015. ^ "Paperback Trade Fiction - November 15, 2015". The New York Times. November 15, 2015. ^ "Paperback Trade Fiction - November 22, 2015". The New York Times. November 22, 2015. ^ "Paperback Trade Fiction - December 6, 2015". The New York Times. December 6, 2015. ^ "Paperback Trade Fiction - January 17, 2016". The New York Times. January 17, 2016. ^ "Paperback Trade Fiction - January 24, 2016". The New York Times. January 24, 2016. ^ "Paperback Trade Fiction - April 24, 2016". The New York Times. April 24, 2016. ^ "The Martian: Classroom Edition". Penguin Random House. May 3, 2016. ^ "Andy Weir: The Short Story Prequel to The Martian". WHSmith. September 30, 2015. ^ Weir, Andy (September 11, 2017). Der Mars Survival Guide. Heyne Verlag. ASIN B0759RS89L. ^ "Fiction Book Review: The Martian by Andy Weir". Publishers Weekly. November 25, 2013. Retrieved April 24, 2014. ^ "The Martian by Andy Weir". Kirkus Reviews. December 8, 2013. Retrieved March 28, 2014. ^ Nance, Kevin (February 17, 2014). "Astronaut is lost in space in thrilling 'Martian'". USA Today. Retrieved January 6, 2015. ^ "Review: The Martian by Andy Weir". Amazing Stories (610). April 2014. Retrieved January 6, 2015. ^ "2015 Seiun Awards Winners". Locus. June 30, 2015. Retrieved October 3, 2015. ^ Chan, Melissa (February 25, 2016). "Newly Discovered Flower Named After Matt Damon's The Martian Character". Time. ^ Martine, Christopher T. (September 28, 2015). "Why I'm Naming a New Plant Species After The Martian". The Huffington Post. ^ Martine, Christopher T.; Frawley, Emma S.; Cantley, Jason T.; Jordon-Thaden, Ingrid E. (February 25, 2016). "Solanum watneyi, a new bush tomato species from the Northern Territory, Australia named for Mark Watney of the book and film 'The Martian'". PhytoKeys. 61: 1–13. doi:10.3897/phytokeys.61.6995. PMC 4816977. PMID 27081345. ^ "2016 Hugo Awards". The Hugo Awards. August 20, 2016. ^ Sneider, Jeff (May 15, 2013). "Drew Goddard in Negotiations to Write and Direct 'The Martian' for Fox (Exclusive)". The Wrap. Retrieved February 16, 2014. ^ Kit, Borys (May 13, 2014). "Ridley Scott in Talks to Direct Matt Damon in 'The Martian' (Exclusive)". The Hollywood Reporter. Retrieved May 14, 2014. ^ Kroll, Justin (September 3, 2014). "Jessica Chastain Joins Matt Damon in Ridley Scott's 'The Martian'". Variety. Retrieved September 3, 2014. ^ Sneider, Jeff (October 10, 2014). "'Community's' Donald Glover Joins Matt Damon in Ridley Scott's 'The Martian' (Exclusive)". The Wrap. Retrieved October 12, 2014. ^ Anderton, Ethan (August 1, 2014). "Fox Shifts Release Dates for 'The Martian,' 'Miss Peregrine' & More". FirstShowing.net. Retrieved August 2, 2014. ^ Vilkomerson, Sara (December 19, 2014). "Ridley Scott sends his 'Martian' script into space". Entertainment Weekly. Retrieved December 26, 2014. ^ Dunn, Marcia (October 29, 2015). "Report: NASA needs better handle on health hazards for Mars". Excite.com. Associated Press. Retrieved October 30, 2015. ^ "NASA's Efforts to Manage Health and Human Performance Risks for Space Exploration (IG-16-003)" (PDF). NASA. October 29, 2015. Retrieved October 29, 2015. ^ "Human Space Exploration: The Next Steps". Center for American Progress. October 28, 2015. Retrieved October 29, 2015. 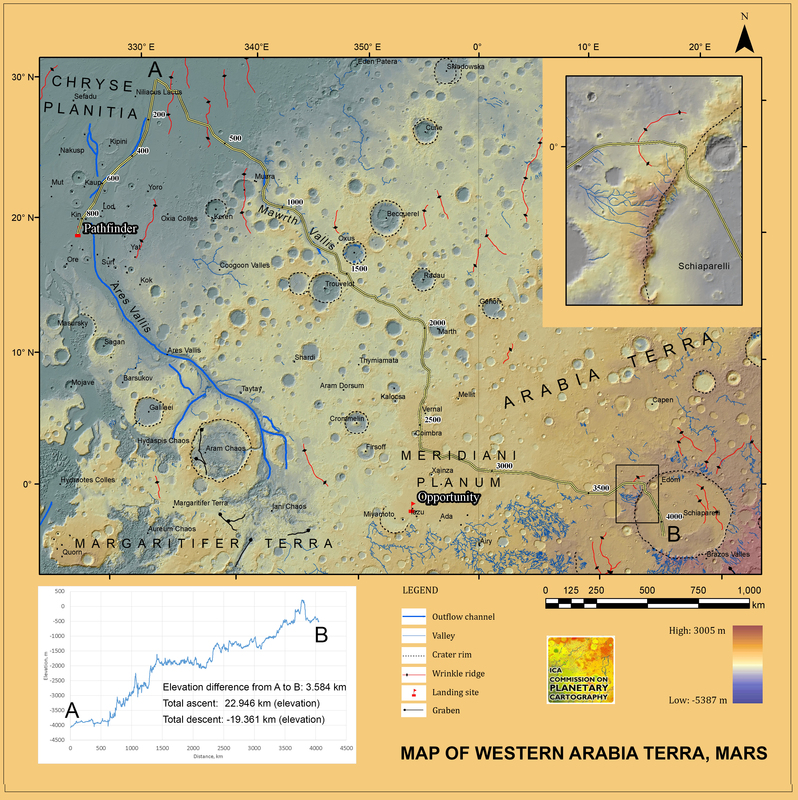 Geological map of Mars showing the route of Watney. From the Commission on Planetary Cartography.